No residual weed control. Effective in burning off Duckweed and Watermeal Mats — add non-ionic surfactant to enhance kill. DIAGNOSIS: Excess of submerged and floating aquatic vegetation is interfering with recreational use of pond or lake. 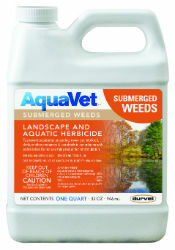 Dosage: Can be mixed with AquaVet Algae Control for synergistic control of submerged aquatic weeds (See label rates). ONE QUART with 25 GALLONS water plus 8 OUNCE of Surfactant treats 10,000 sq. ft. (1/4 acre) surface area. Treat clear calm water (avoid turbid, muddy water).